Want to know which paper to choose? The following instructions are a general guideline and may not apply to all of our heat transfer papers. Please review the product instructions of the individual paper you are using for complete details. Make sure your image is in reflection or mirror image before printing (not applicable for Opaque transfer papers or 'colour copier' transfer paper). It is not necessary to print your image with oversaturated colours as it will not enhance the quality of the image in most cases*. Print image on coated side of transfer paper. The reserve side will have grids or lines. Allow drying time before handling. Trim your transfer with a paper trimmer or scissors. Preheat your press. Use the temperature guidelines provided with the heat transfer paper you will be using. For best results, pre-heat garment for a few seconds to remove wrinkles. Allow garment to cool. 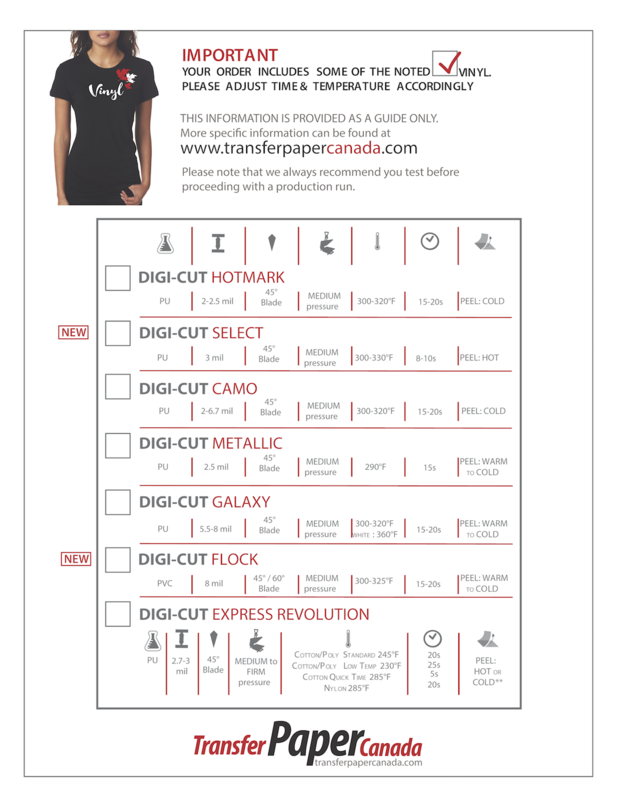 Most transfer papers require you to place your printed transfer image face down onto fabric and press for approx 15-20 seconds (see your heat press manual and transfer paper for exact timing). Check your transfer paper instructions to indicate if you can peel the transfer hot or if it requires to be completely cooled down. Not all transfer papers are compatible with using a hand iron application. Consult your heat transfer paper for instructions. Preheat your iron to the highest setting without steam. Before beginning, make sure you have a smooth dry surface for ironing. It is recommended to use a hard, smooth and non-porous surface under your garment, not an ironing board. Position the transfer paper image side down onto the garment. Using firm pressure, slowly run the iron over the entire surface evenly ensuring you overlap areas for approx 2-5 minutes (depending on your individual transfer paper). Turn your garment inside out when placing in the washer. We do not recommend using a dryer as this will shorten the lifespan quality of the transferred image. Wash according to the garments fabric instructions. Store unused transfer paper in a flat, dry, cool area in a sealed bag to prevent moisture.